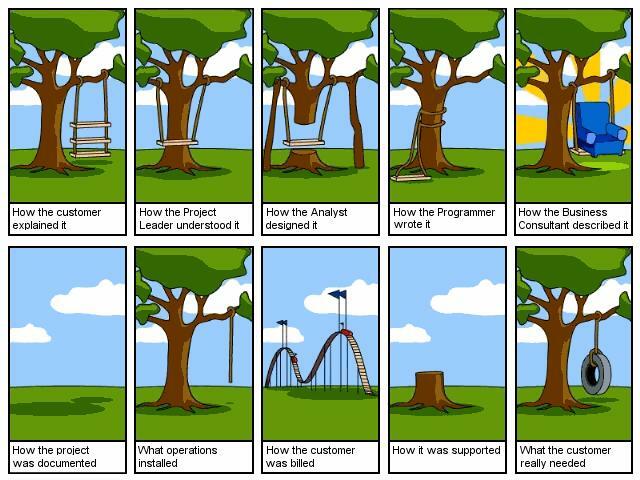 The cartoon above is the best illustration I know for the so usual communication problems in software projects. This difficulty to capture the customer needs and correctly translate them in the form of requirements, design and working code is one of the main motivations for the methodology of Agile software development. As I discussed in a previous post, I believe in iterative methods and fast prototyping. I have been applying this approach in all my projects in the last years, and I’m very happy with the results. Among the benefits, I have been able to deliver more frequently and adapt more easily to changing requirements. This entry was posted in Agile, Requirements Specification and tagged Agile, Requirements. Bookmark the permalink.